Nah, Dana didn't knit these. 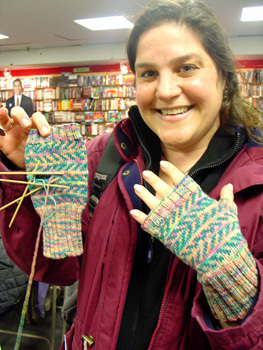 They're fingerless mitts Nancy is making with, what else, Koigu! 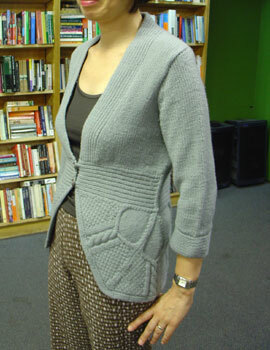 Nancy's lovely Grey Cables Jacket (by Debbie Bliss) modeled by May. And Nancy came the same day with her amazing Manon (from Nora Gaughan vol. 1) in almost the same color! 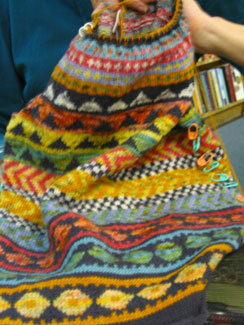 This week Nancy brought in a scarf she's making with Kaffe Fassett's new yarn, Colorscape Chunky. 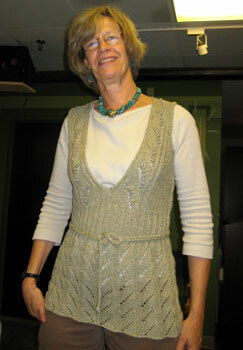 While I was gone, Nancy finished her beautiful Bonsai Tunic by Norah Gaughan from Interweave Knits Spring 2007. 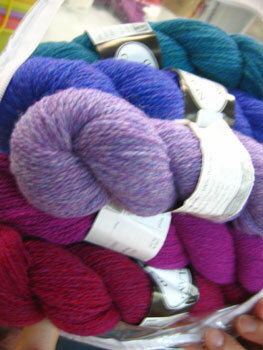 Manon mania has hit the Knitsmiths! May started knitting Manon when she first saw Nancy making one. Here's Nancy's. It's gorgeous, but didn't fit Nancy quite right, so she gave it to May. And now Nancy's making another one for herself! 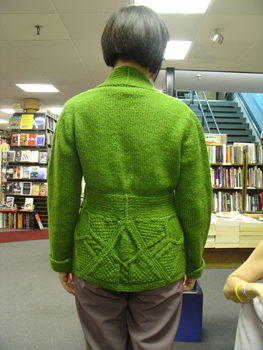 Nancy's beautiful Harmony cardigan. 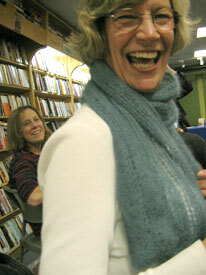 She knit it in a wonderful shade of Katmandu/Jo Sharp Tweed. Nancy knows color. She's always making the most stunning color projects. 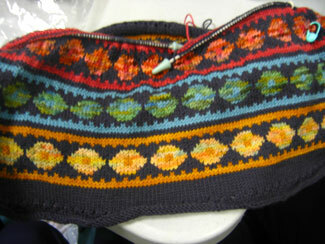 Here's a vest she's working on in Fiesta's Boomerang yarn (color name: Taos). Isn't it gorgeous?! 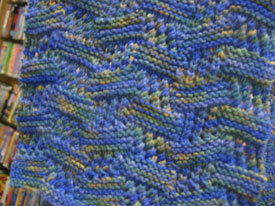 And up next is another stranded color project in these beautiful Harrisville yarns. 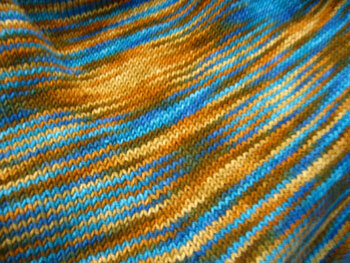 Nancy's got another gorgeous sweater in the works! 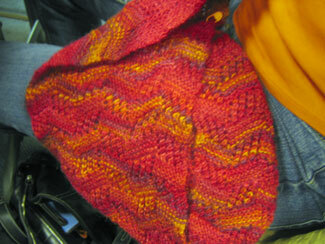 She knitting it in Rowanspun and has just finished the awesome cowl collar. This one is going to look terrific on her! Nancy says practically every store seems to have this sweater as a sample in its window. But I say none of them looks as fabulous as hers! 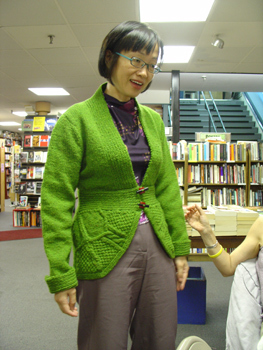 She cleverly added some ribbing and a tie to the waist, really improving the fit and drape of the sweater. And that orange is spectacular! 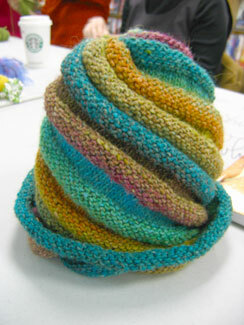 Check out this cool bias Noro hat that Nancy made! 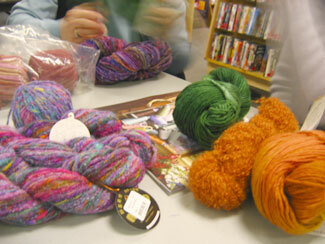 She and May and Claire went on a Yarn Safari up to Maine and found the pattern and yarn at a store up there. Coooool! 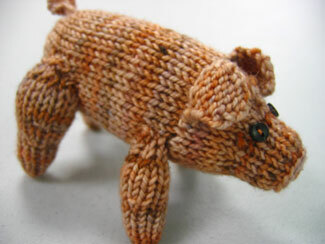 Check out the cute little piggie Nancy's daughter made her for Christmas! 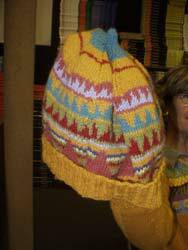 It's knitted in leftover Koigu (of course, what else would you use for a present for Nancy?!). 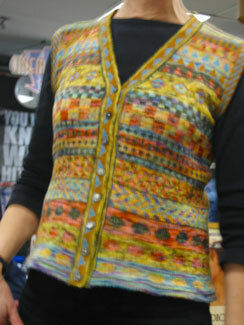 And here's Nancy's latest amazing design, a striped vest in two different Noro yarns. 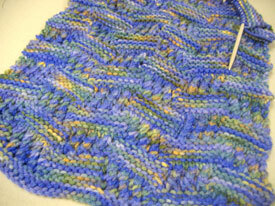 Nancy's still working on her Mountain Mohair Midwest Moonlight scarf. 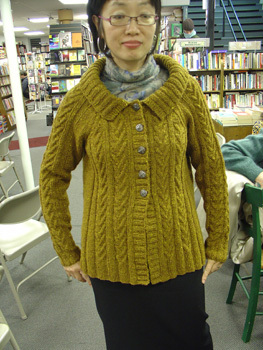 And she just finished a lovely sweater in an almost solid blue shade of Mountain Mohair. 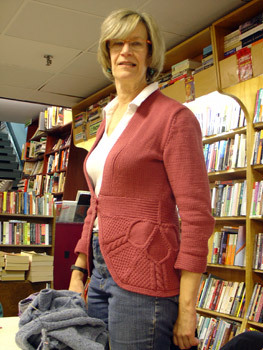 She created the sweater on her own (Nancy doesn't need patterns! 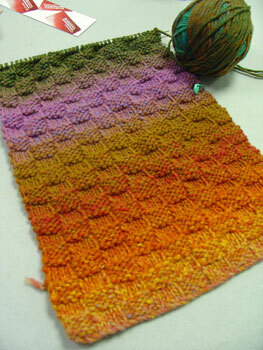 ), but used the same lace stitch that she used in her Kidsilk Haze scarf as the inspiration. Nancy's gone multidirectional! 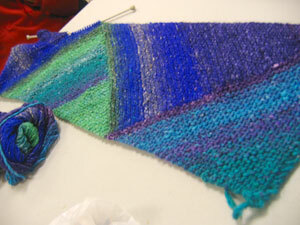 She's working on a multidirectional scarf in Noro Silk Garden. Look at those great colors! Nancy's third (or is it her fourth?) Midwest Moonlight scarf! 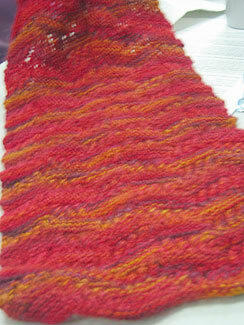 And she's working on a beautiful cabled sweater in Karabella's Aurora 8. 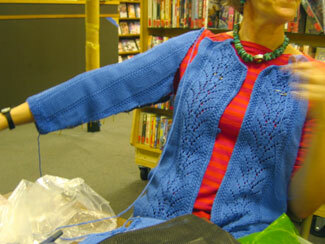 Nancy's finished the knitting on her Fountain Lace cardigan and just has to sew it up! 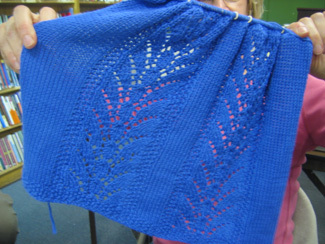 Nancy's starting the fountain lace cardigan. 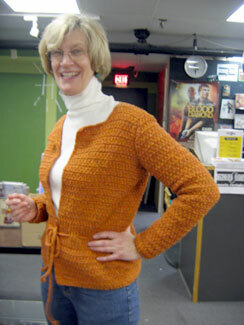 After seeing Johanna's finished cardi a couple of weeks ago, she decided to make one for herself. Look at that incredible blue of the Bam Boo yarn! 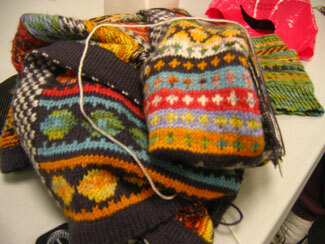 Nancy has done her steeks and is working on the bands of her second fair-isle Koigu vest. Incredible!! 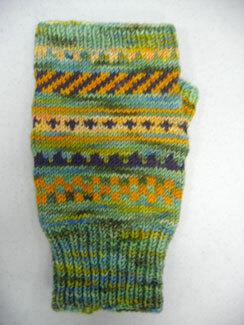 And she's using leftover Koigu to to make fingerless mitts. Check out the prototype! 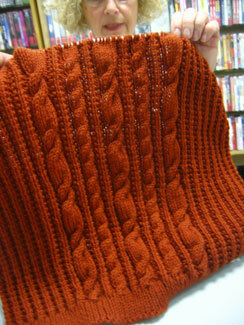 Nancy's second Koigu vest is stunning so far! Can you beleive that that's all Koigu? (Okay, the black is Rowan 4ply soft, I think). Wow! Nancy brought her Koigu again this week! 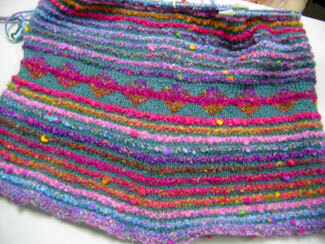 Nancy is starting another Koigu vest and it's even more gorgeous than the first one! 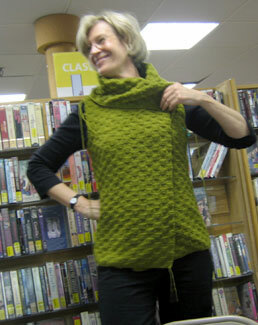 And the piece de resistance, Nancy's finished Koigu vest! She just finished adding the beautiful fair-isle borders and edgings and wore it to knitting group for us all to wonder at. 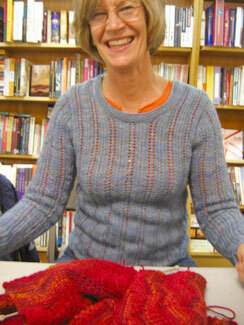 Nancy's finished another Midwest Moonlight scarf in Great Adirondack Co.'s Montana yarn. This one is for herself and has the most amazing greens and blues in it. 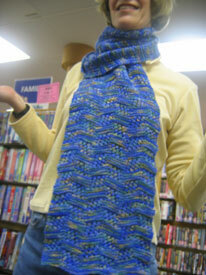 Nancy finished the gorgeous Midwest Moonlight scarf she's been knitting for her daughter. Call this one Montana moonlight, because the colors in that beautiful Montana yarn (by Great Adirondack) really steal the show! 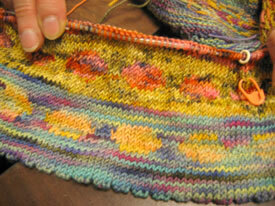 Nancy is just getting started on a scarf for her daughter in this amazing Montana yarn from Great Adirondack Co. 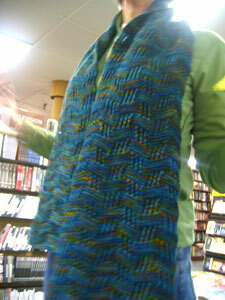 The pattern is a Knitsmiths' favorite: Midwest Moonlight from Scarf Style. Nancy finally got to bind off her beautiful lacy Kid Silk Haze scarf this week! 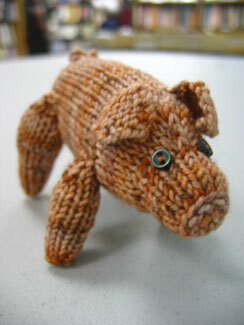 She says that the knitting has been torturous at times, but we all think the result is incredible. Well done, Nancy! 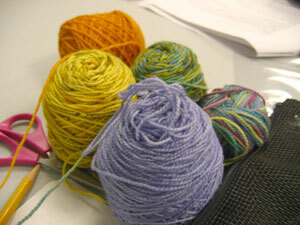 Nancy picked out many varied shades of Koigu and is putting them together in a stranded design of her own creation. Soooo pretty. 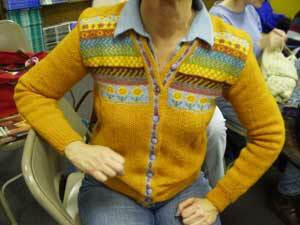 Nancy designed this incredible fair-isle cardigan herself. And a hat to go with it!